Jackson Bradford might have the most interesting job in music. 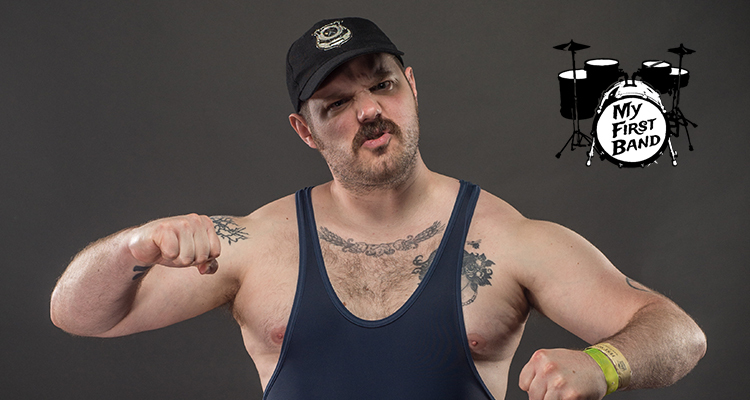 The Milwaukee native spends at least half of each year wearing a cop costume and short-shorts while sporting a mustache as part of his lovable “heel with a switch” character that Masked Intruder fans know as “Officer Bradford.” The pop-punk villain’s unique line of work has taken him to Europe, Asia, Australia, and much of North America. Currently, Bradford’s punk rock patrol is taking him all around the country, as Masked Intruder is on a tour in support of their new album, III. Before he hit the road (and prior to Masked Intruder’s April 2 show at Turner Hall), Officer Bradford met up with My First Band host Tyler Maas to discuss his charity calendar and all of the…more conventional bands that came before he landed his unique role in Masked Intruder. Bradford talked about his Masked Intruder origin, then got into his time in unheralded suburban Milwaukee acts like Mindframe and Leafrust before being tabbed as the original bassist for Direct Hit! My First Band is sponsored by Boulevard Brewing and PrideFest Milwaukee. The show is edited by Jared Blohm. You can listen to My First Band on iTunes, Stitcher, Spotify, and wherever else you get podcasts. Music used in this show comes courtesy of Devils Teeth (“The Junction Street Eight Tigers”), Mindframe (“Outbreak”), and Leafrust (“Still Love Me In Heaven”).